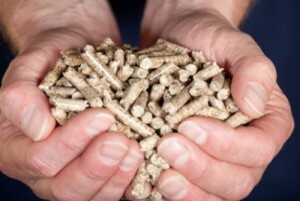 Wood pellets are a convenient, renewable alternative to gas, oil and electricity for heating. They are produced by grinding, drying and compressing wood from sustainably-managed forests into pellets, typically 6 or 8 millimetres in diameter and a couple of centimetres long. Wood pellets pack a lot more energy into a given space than other wood fuels. They burn cleaner (less ash and emissions). They can be delivered to the boiler using automated systems. Verdo Wood Pellets are specially designed to burn in wood pellet boilers. These 6mm pellets are manufactured by Verdo from wood harvested from sustainable forests throughout Central Scotland. Land Energy manufacture low carbon, premium quality wood pellets in their production plant in Girvan, Scotland from virgin feedstock sourced from UK sustainable forests. Ailsa Renewable Energy is a Biomass Suppliers List authorised supplier. We also supply great value Timber products and Fencing supplies, including Gates and Garden Sheds. We are a specialist wood pellet stockist. We supply and deliver bagged wood fuel throughout south west and central Scotland. Wood Pellets are a low carbon and renewable fuel source for use in wood pellet boilers and wood pellet stoves. Wood Pellet boilers are a worthwhile solution to many renewable fuel installations, including shops/small businesses, schools, hospitals, office and domestic houses. Our wood pellets are delivered to your address in 10kg bags or a pallet of 98 bags. The bags only weigh 10 kg and are easy to handle, stack and store. They can be lifted easily and tipped into your pellet stove, boiler or fuel store. We deliver up to 15 tons loose bulk blown wood pellets. Please ring for quote: 01465 881372. • 6mm or 8mm wood pellets. • Delivery available throughout Ayrshire, central and south west Scotland. • Delivery available normally within 3-5 working days’ notice. We supply wood briquettes which offer easy, convenient combustion and are suitable for burning in multi-fuel stoves, log burners and open fireplaces. The briquettes are packed in easily managed packs of six briquettes, weighing approximately 10kg. Dimensions: 7cm x 7cm x 30cm (length). The briquettes are brittle and can easily be broken by hand, if required, to fit smaller stoves. The UK has set targets for using renewable energy, including wood fuel, as part of the drive to reduce carbon emissions. Heat generated from renewable energy sources currently meets 1 percent of the UK’s total heat demand. To reach the first renewable energy target, set for 2020, around 12 percent of the UK’s heat has to be generated from renewable sources. This is why the Government is introducing a Renewable Heat Incentive, or RHI, which will reward users of renewable heat installations, in effect paying them to use their own heating systems. Read more about the RHI here.